Preheat barbecue to medium and cook lamb, covered, for 25 minutes, turning halfway. Transfer to a clean plate, season, loosely cover with foil and rest for 10 minutes. Thinly slice lamb. Meanwhile, heat oil in a large non-stick frypan over medium heat. Add onions and currants, season and cook for 10-12 minutes or until onions have softened and caramelised. Add kale, carrot and lemon juice; toss to combine. Cook for a further minute then remove to serving bowl. 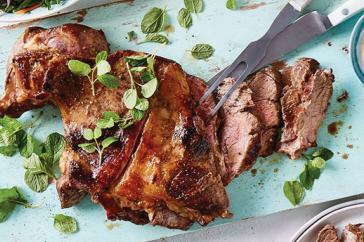 Serve with sliced lamb, yoghurt sauce and mint sprigs. YOGHURT SAUCE: Combine all ingredients in a small bowl with half a teaspoon of sea salt flakes. Stir to combine, adding enough warm water to give it a thick creamy consistency. Ensure the thickness of the butterflied lamb leg is even by slicing and opening out the thicker half. This will ensure even cooking. Leftover lamb can be sliced and added to a salad with sliced baby cos lettuce and tabbouleh. Make sandwiches from leftover lamb; other fillings can include pickles and sliced tomato or hummus and sliced cucumber.